First, I have to say HAPPY FRIDAY! Can you tell I'm excited? I've literally been counting down the days, 1. because I'm headed on vacay, and 2. this week has been insane at work... so so so busy! Glad to finally get a break (and SLEEP IN!!). Anyways, my sister, Callie, wanted to go grab ice cream last night... I (stupidly) went and put on white pants... because there's always a higher than average chance I spill when I am in white. Luckily, there were no spills involved! I was sitting in my freezing cold office, so I actually was glad to have this top on all day. This is a little 'trendier' and younger of a style than I normally go for, but the chiffon layer of ruffle really caught my eye. I think it'll be fun with skinny black pants and flats for work in the fall and winter. The back adds a really unique and flirty touch. 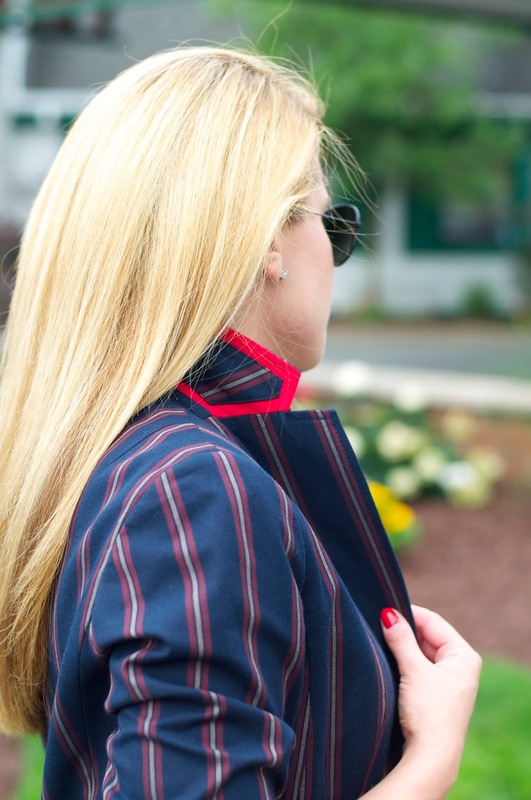 It's under $60 and offered in several different color combos. It runs big. I am in an XS, and usually wear a small in most tops. We all know my obsession over these pants. They have a classic 5 pocket design like denim, but the material is like a stretchy chino. Not to mention, they are not see through at all and so comfortable! Today I am headed to Georgia to the lake! I am so excited to be with family and friends for a super fun and relaxing vacation. Be sure follow along via Instagram and Snapchat (SummerWind41490) to keep up! I'll have scheduled posts all next week per usual, but I won't be checking in here on the blog or e-mail as much as usual, so see you on Insta! Have a fabulous day! My excitement level for my visit to Paris (which is still months away) is at a full fledged level 10. I've taken about 10 years of French throughout all of my schooling. While I wish I was fluent, I'm not... I haven't really practiced much at all since college. 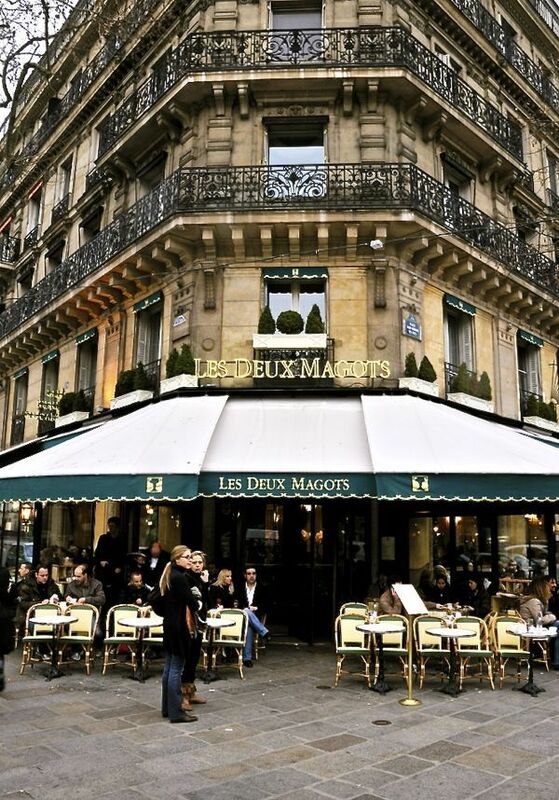 I am glad to still be able to read and understand spoken French pretty darn well, but when it comes to writing and speaking myself, that's where I always run into trouble. Last night, I was at Happy Hour with some good friends. Sidenote: Pittsburghers, we went to Arsenal Cider house in Lawrenceville. It was a new-to-me place, and the outdoor seating and ability to bring your own food was amazing. The cider was so good and our picnic of a baguette, crackers, meats, cheeses, spreads, etc. was perfect! Definitely recommend for those in the city! Anyway, while at happy hour, one of my friends suggested I check out Duolingo. It was an app created in Pittsburgh and it's free! I downloaded it last night and am already obsessed. It takes you through different levels of whatever language you choose. You go through tasks and tests and lessons to improve! I definitely recommend this to everyone. Since it's free, it really is a no brainer! It also shocked me when I took the test; I know a lot more than I thought I did, but still have so much to learn! Have you tried this app yet? If you are out of school, do you have other ways of continuing to practice a foreign language? I'd love to know... studying a foreign language is something I miss from school! Have a fabulous day! It's been quite hot here.. which is so not my thing. I love the fall.. 65-70 degrees is right where I like it. This whole 90+ degrees... not so much. The worst is when it is 90, and I leave work and have to get into my car... I actually dread that moment. I've been reaching a lot for denim shorts lately. 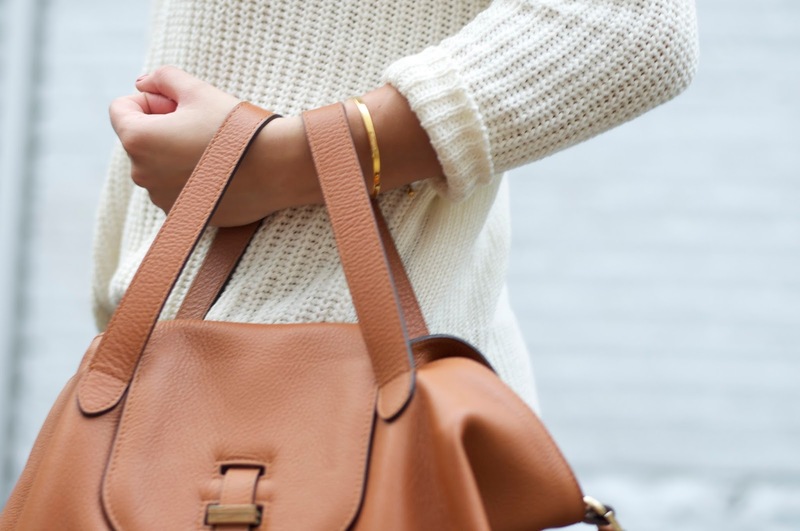 They're super simple and casual and great for running weekend errands. I've had these shorts since I was a sophomore in college... they're the only pair of jean shorts I own. I'm really eyeing this pair, but I honestly think one pair is enough! I think the key to denim shorts is to never try and dress them up. They are super casual and I think where a lot of people go wrong with denim shorts, making them look tacky, is when you try to dress them up. 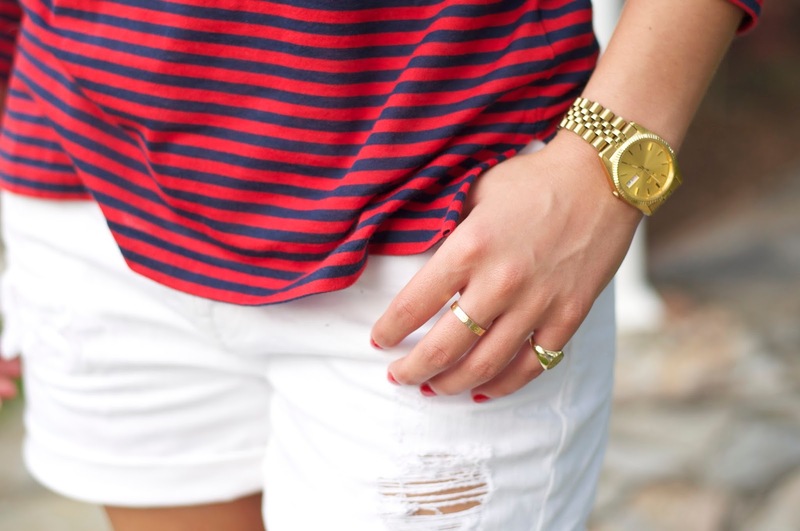 I embrace the casual-ness of denim shorts and love to pair them with sneakers, cotton tanks, oversized sweaters, etc. I wore this last weekend while running some errands. Since I am in and out of places, I always make sure to have a sweater on hand because sometimes the air conditioning can be ridiculous, ahem, I'm looking at you, Fresh Market. This one is great because it is neutral and lightweight, so I'll even leave it in my car so I have it whenever I need it. It's on sale right now for under $50... a really good price for the quality. I think it'll look great with skinny jeans and boots come fall, too. Have a fabulous day! Finding a good pair of jeans is really hard. I'm pretty sure everyone reading knows what I'm talking about. I have found a few pair that I really like and that really work for me, which is great. When Talbots reached out to see if I wanted to try out their new line of denim, I jumped on it. I love Talbots, so I was really excited to see what this new line was all about. I chose the boyfriend style denim, because they're so comfortable. Bottom line? These jeans rock.. they're well made, high quality and fit wonderfully. 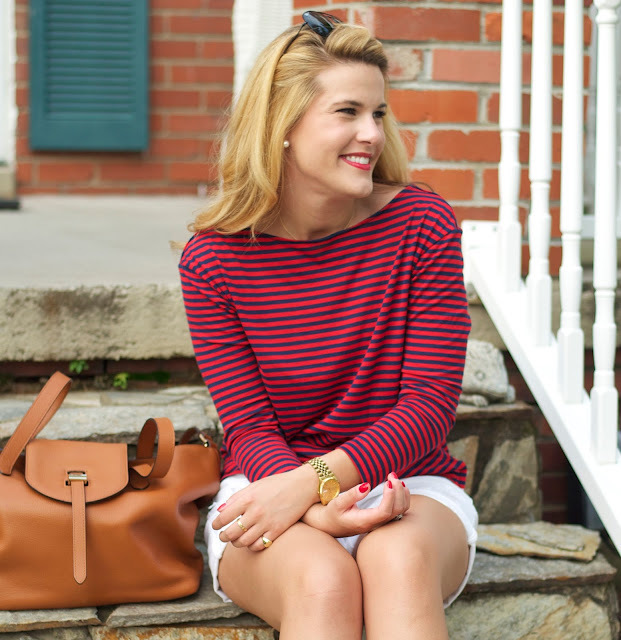 Since Talbots is coming out with some of their fall pieces, I styled it in a way I would wear it in September/October. 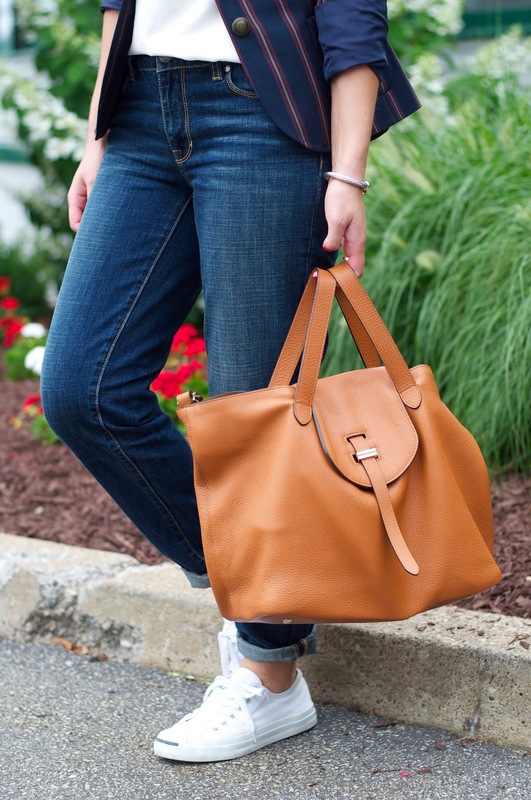 The thing I love about boyfriend denim is that you can really style them in a lot of different ways. In this post, I've styled them dressier with a clutch and heels, but then made the outfit more laid-back with a bigger bag and sneakers. The fit is awesome. It has a higher waist, which is always something I appreciate as as well as a classic 5-pocket design. In a lot of boyfriend jeans, I usually have to size down at least one size, if not two or three sizes. These actually fit true to size. I am in a size 4 in the photos above and I feel that they give the perfect amount of baggy without looking frumpy. Not to mention, these are not distressed, which makes them have the ability to be dressed up! If the boyfriend denim is not for you, there are several other styles to choose from. Next up, I want to try out the jegging-- they would work so great with riding boots! The best part? 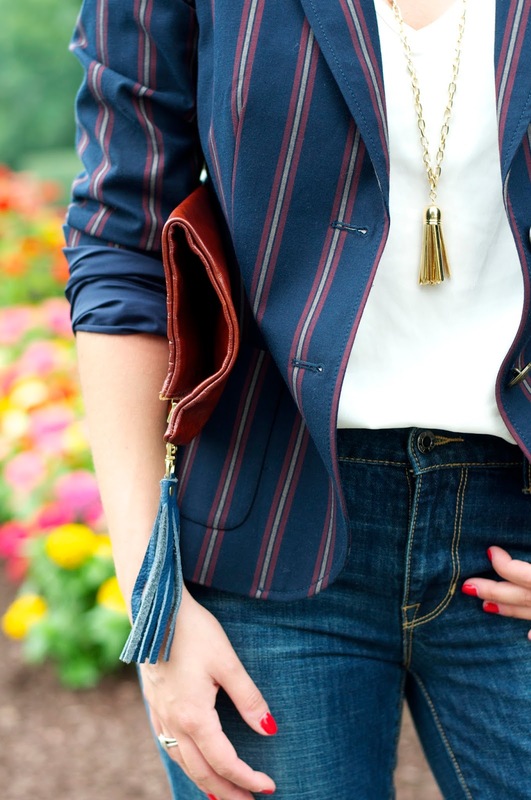 Their denim is under $100, which is a real win in my book! Have you tried out the Flawless five-pocket denim yet? 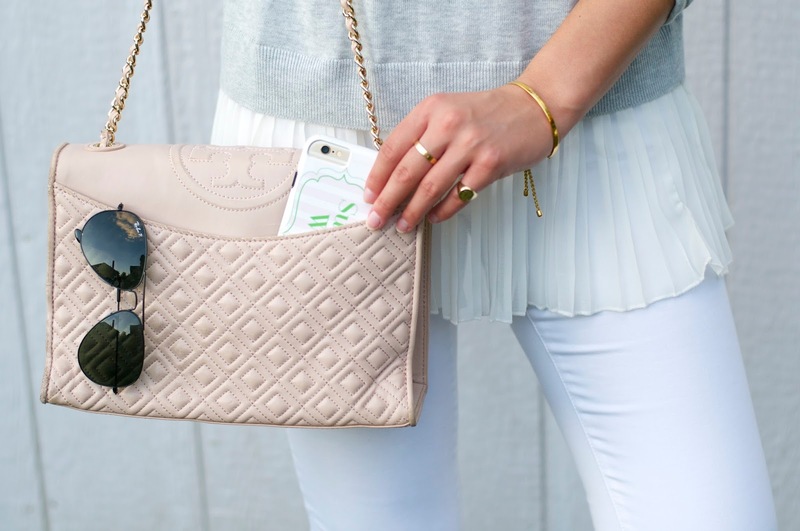 If you try them out, be sure to use the hashtag #Flawless5Pocket to be featured on the Talbots website! Have a fabulous day! I used to be a huge 'color' person... as I got older, I recognized that a good wardrobe consists of neutrals and basics with pops of color and prints here and there to add interest. 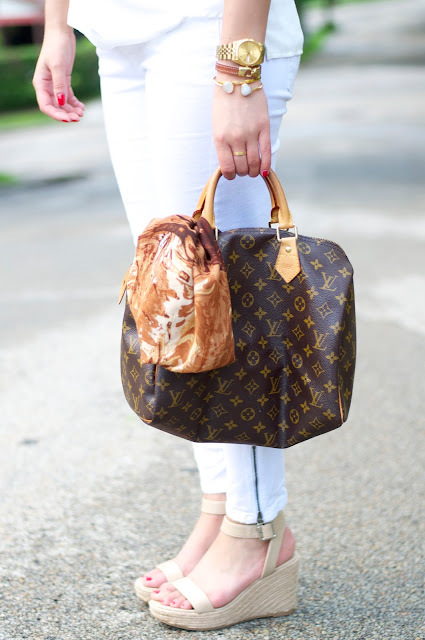 Don't get me wrong, though, I do love a good, classic, Lilly or an obnoxious printed pant every once in a while, but for the most part, I'm pretty neutral day in and day out. I also think that has to do with being in an office setting 40 hours a week as well as living in a city. With that said, if you've been reading here even just for a few weeks, then you know I have a cashmere addiction.. ahem, I actually would prefer to call it a 'collection'. I'm always hunting for a great piece, because there is nothing I hate more than being cold. I went crazy over Club Monaco's Adele cashmere scarf. When they went on sale, they were a great buy, and also the biggest cashmere scarf in size for the price. Then, this happened. It is MASSIVE. Honestly, it's a cashmere blanket that's aptly named a cashmere travel wrap to make it acceptable to wear a blanket out in public. I took these photos quickly one night as I was headed to a friends house for a party. It had rained earlier so it was slightly chilly and I knew the party would be outdoors, so this cashmere travel wrap was the perfect thing. The pink pumps were probably not the best choice of footwear, but I had just gotten them and was dying to wear them! I got so many compliments. I love the pop of pink and think they'll also look really great with all black outfits. Everything I am wearing (besides my sunnies) are under $100! 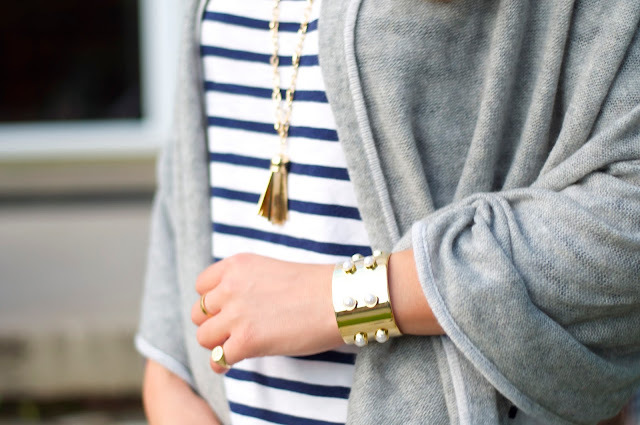 Did you scoop up this amazing cashmere wrap? Have a fabulous day! Hope everyone's weekend is off to a great start! Tonight, I'm headed out to celebrate my friend Kaska's birthday and then will hopefully meet some other friends out, too! Then, Sunday, I'm headed to a baby shower luncheon for one of my best friends and her husband. They are expecting a girl in early October and I could not be more excited for them! We always joke, because I went to her wedding as someone's date, and didn't know her at all, and eventually we have become such good friends! I've been shopping a lot lately because of the Nordstrom Anniversary Sale. I am SO glad I scored this sweater. It was sold out in the grey color I wanted for a hot second, but I kept checking back, and one became available in my size. Score! My favorite thing from the Nordstrom Sale is this cashmere scarf. I'll be posting an outfit post featuring the scarf early next week. I've also been stocking up on some great Lilly prints and preppier pieces for my trip to the lake next week! Scroll above to see what I've been loving lately. Have a fabulous day! Happy Friday everyone! I wanted to share some random things that I've been up to lately/ random snaps I have in my camera roll! 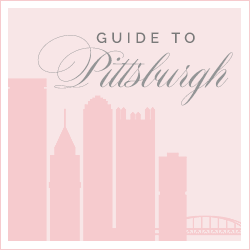 A few weeks ago, there was an event downtown called Cosmopolitan Pittsburgh put on by the Pittsburgh Cultural Trust! I am a member of the Trust and they left no stone unturned at this uber fun circus themed event! I felt that my J. McLaughlin feather skirt fit right in with all the fun circus decor! Funniest par to of the night? The convention center was just blocks away, and the furry convention happened to be going on that weekend. If you haven't heard of a furry, you definitely need to google it (and anthrocon). It's such a bizarre thing to me, but it's a massive conference in Pittsburgh and brings millions to the city each year. It's slightly creepy to me, but it is kind of fun to see these creatures walking all around the city. We left the party for a few minutes to go snap some pics with some of the furries. All in good fun and a fun night! A few weeks ago, I went to the William Penn's Speakeasy. It's such a cool bar/lounge and has some really unique cocktails. 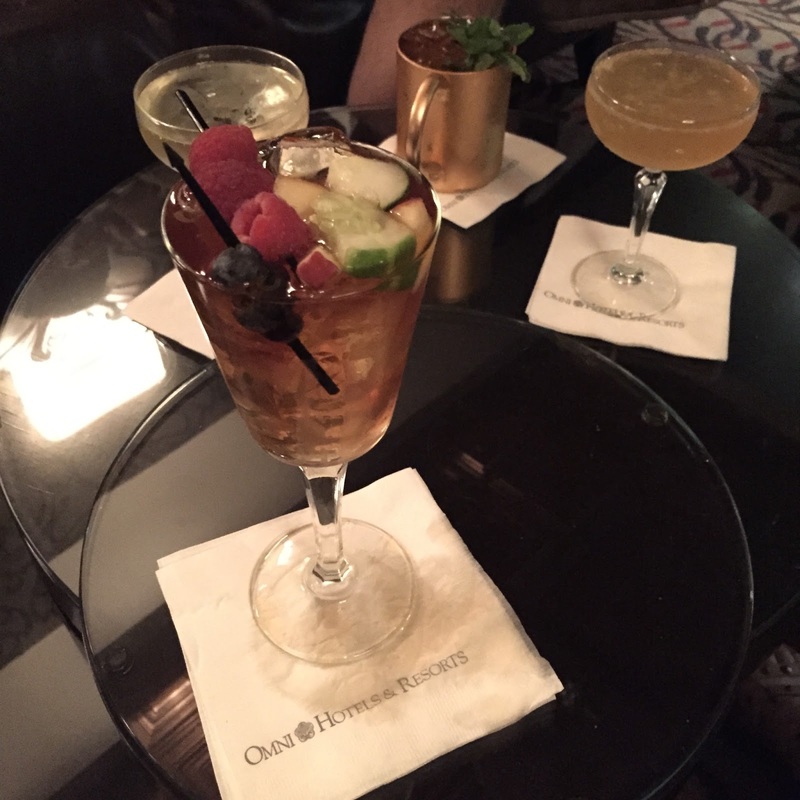 That night, I chose a Pimm's cup, which is out of the ordinary for me. It was my first Pimm's cup and now I am a huge fan! Have you ever tried a Pimm's Cup? I've started to pack for a week at the lake. I've been super stressed out lately between trying to keep up with my social calendar, work, clubs/philanthropies/boards that I am involved in and my blog. I am a very 'go go go' type of person, so having such a booked schedule is great, but honestly, sometimes it gets to me and right now is one of those 'sometimes'. I would be lying if I said I wasn't feeling a tad overwhelmed, so a vacation could not come soon enough! The lake is my happy place. It's a place to relax and spend time with our family and friends and I really cherish my time there every year. 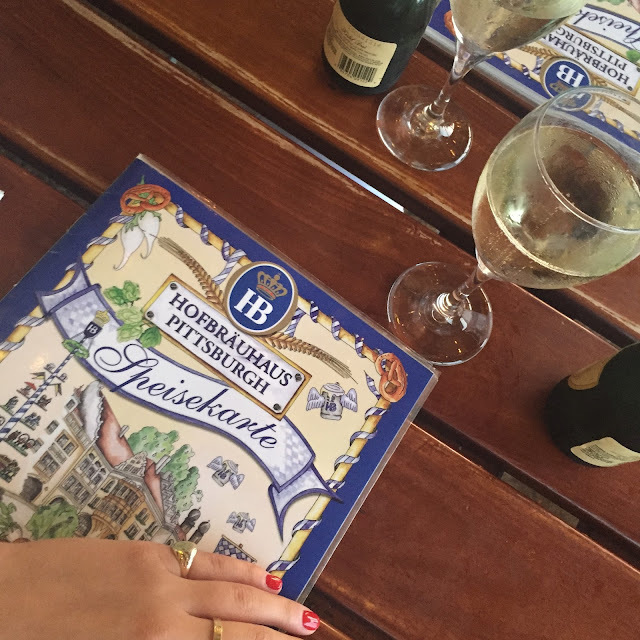 My parents, sister and I went to Hofbrauhaus a few weekends ago. If you've never been, Hofbrauhaus is a German beer hall. I'm not into beer, but they have a gorgeous outdoor patio and the inside almost feels like your in Germany in Epcot.... they also let you stand on your chair to sing and dance! I love a good Reuben and this place has a great one. It's also a place I take all my visiting friends because it is so lively... Since I'm not a beer person, I love that they haves splits of champagne on the menu! Another restaurant I have been loving lately is Sonoma in downtown Pittsburgh. It is right near my office, so it's really convenient to meet friends for dinner and drinks after work. The wine is fabulous as well as the food. I always get the salmon with ginger glaze and the sautéed veggies. YUM. I definitely recommend it if you are in Pittsburgh. The Vintage Grand Prix is a week long event held in Pittsburgh each year. 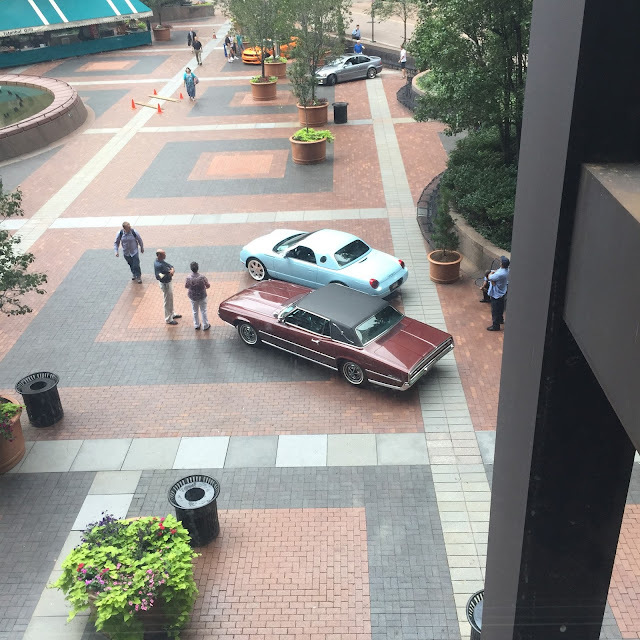 I was supposed to go to the Gala, but ended up not being able to make it, so I was so pleased when the cars started to gather on the patio of my building! 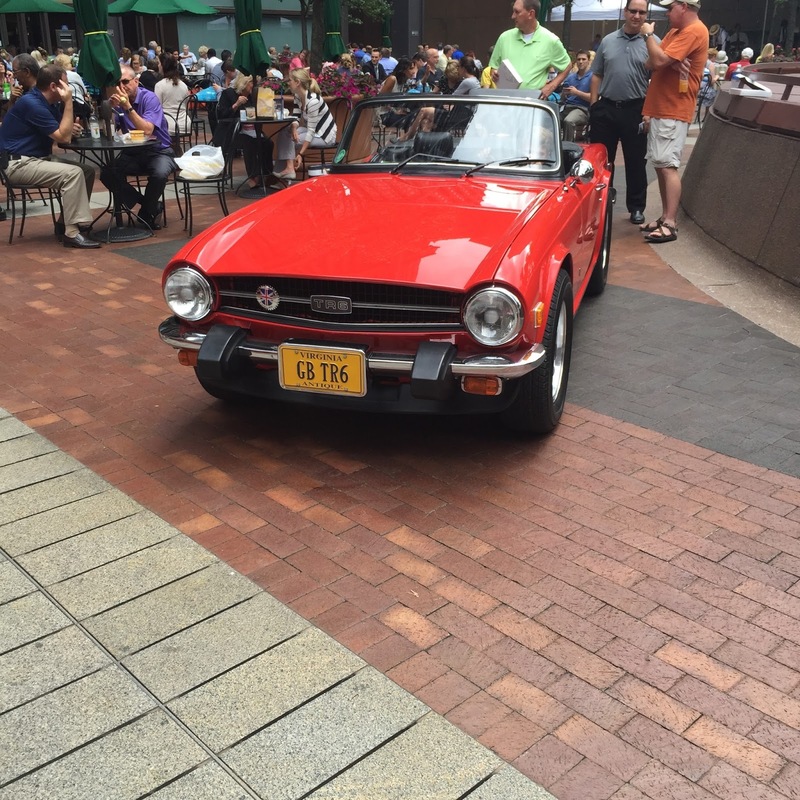 I am not a car person, but it was such a fun lunch excursion to head outside and check out some really cool cars. The red one in the second photo is my favorite! Something I really like about my office building is that there is always something fun going on during lunch time. They often have live music, food vendors and the other day, it was free ice cream for everyone! I went down to DC to visit friends last weekend and my friend Lauren and I shopped around Georgetown one afternoon. I love popping into Lou Lou when I'm there for really cute and inexpensive jewelry. 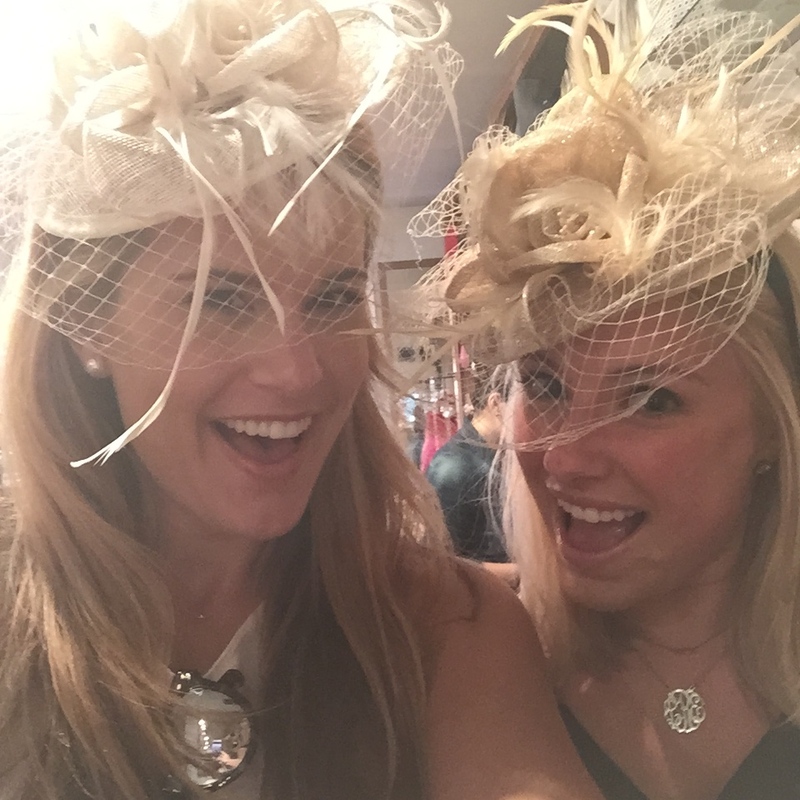 This time, we spotted these fascinators and had to try them on. I literally almost bought one because I felt very Kate Middleton in it.... but then again.. where would I wear it?! 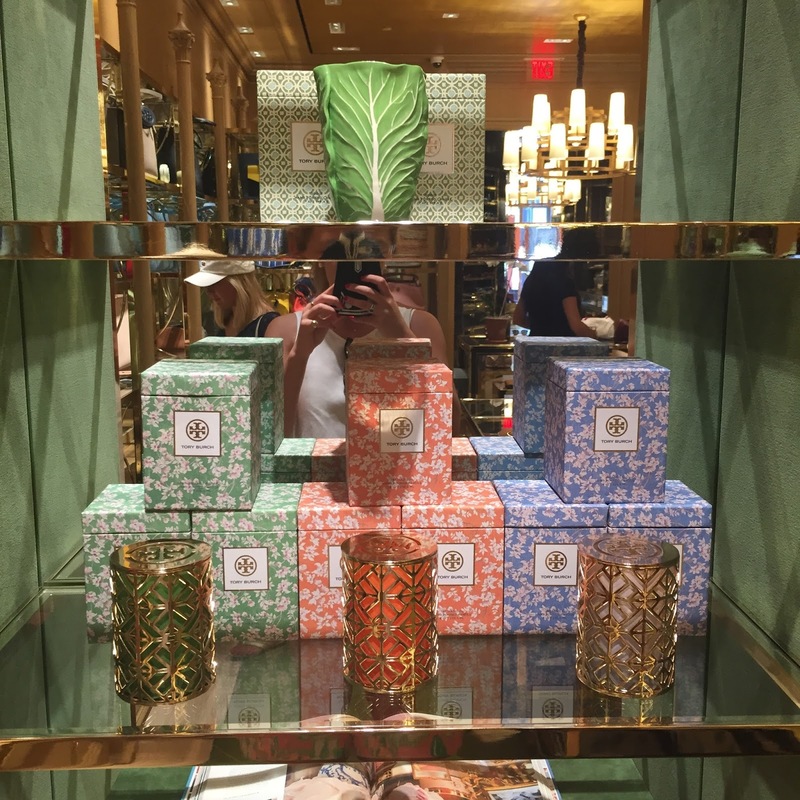 The Dodie Thayer x Tory Burch collection was in the Georgetown store and it is AMAZING in person. I'm so obsessed. I ended up only with the candle, but plan on scooping up the pair of cups and saucers, too. The candle smells so good. I plan to have it hold my makeup brushes when I am finished burning the candle! I basically ate the entire time I was in DC... shocker. 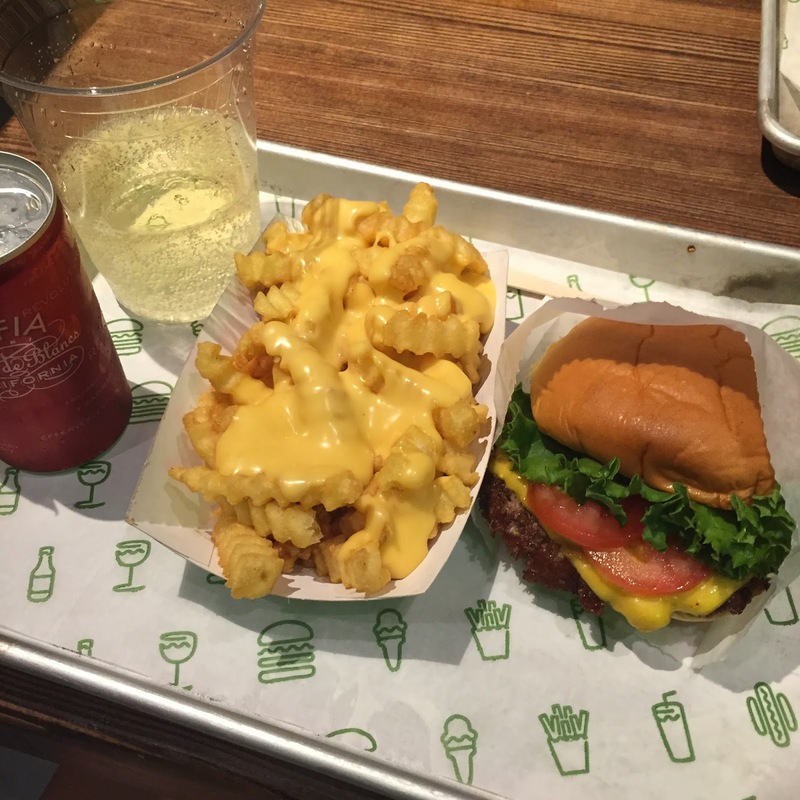 It wouldn't be a DC trip without Shake Shack. We went to P.O.V. at the W one night... a trendy, touristy bar, with over priced drinks, but the view is sooooo worth it and then headed to Shake Shack for a quick bite. Then it was off to Bayou in Foggy Bottom to see a super fun, and new-to-me band called Kendall Street Co. They were so good and covered so many of my favorite songs. We danced so much, I totally burned off that burger from earlier in the night ;) I'm going to have to do separate post about my DC trip and on my love for Paolo's including pics of our food. It is my absolute favorite! You can check out my DC Guide, here! This weekend I am celebrating a friend's birthday and going to another friend's baby shower-- it's my first baby shower of my friends, so I am very excited to celebrate with her and her husband! I'm also really looking forward to sleeping in a bit. Like I mentioned earlier in this post, I'm been burning the midnight oil, quite literally way too much lately, so my bed is calling my name! What's on your agenda? Have a fabulous day! All white, all the time. 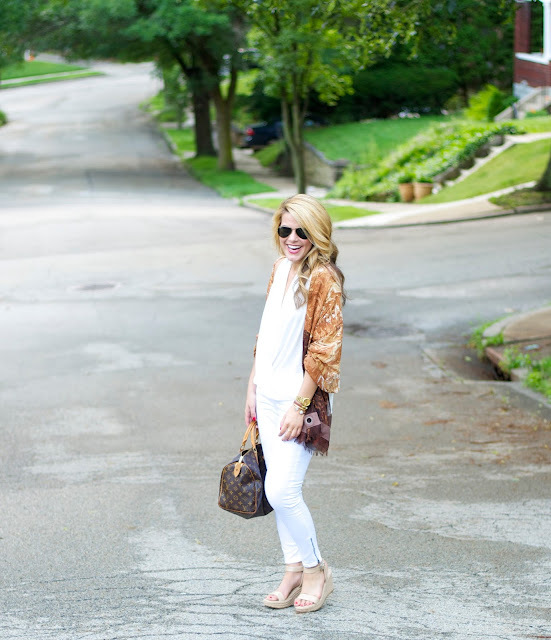 If you've been reading for a while, then you already know how much I love white on white during the summertime. 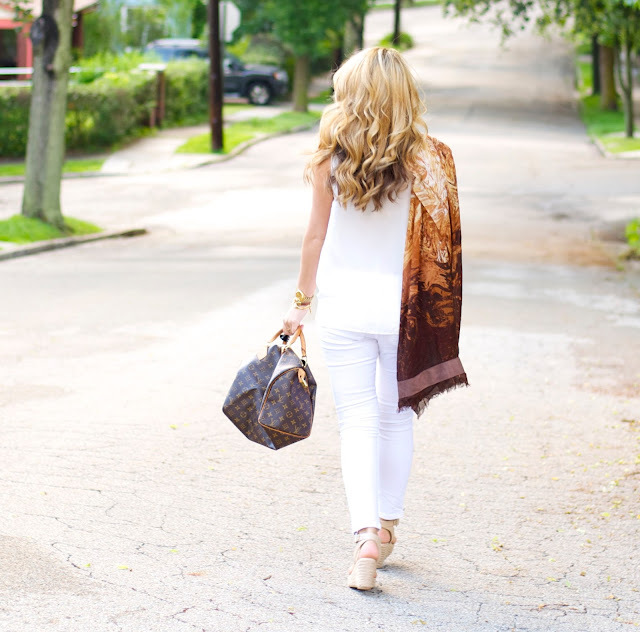 When I received this gorgeous chocolate brown wrap from MAGNUM x BCBGMAXAZRIA, I knew it'd be the perfect accessory to complement the all white look. We all know how much I love a wrap, and this one is no different... or is it? If you're not familiar with MAGNUM, they are the most delicious ice cream bars ever. They're very decadent and made with delicious Belgian chocolate and the creamiest of ice cream. Basically, if you have them in your freezer, they'll be gone in a day.... or at least that's what happened to me. As I was researching, a fun fact about MAGNUM is that they were the first ice cream bar to be marketed to adults rather than children... pretty neat fact! This wrap is the product of BCBGMAXAZRIA’s style guidance and master perfumer, Christophe Laudamiel (seriously, Google him, his resume is quite impressive) who wanted to create a wrap that was a sensory experience that represents Magnum ice cream bars. When the wrap arrived, I opened it and it has a delicious, light, chocolate scent. I also love the added suede patches to each end of the scarf... it adds some texture and interest just like the creamy caramel adds interest to the actual MAGNUM ice cream bar! You can get your own limited edition MAGNUM x BCBGMAXAZRIA scarf as a gift with purchase this summer at BCBGMAXAZRIA stores. Have a fabulous day and thank you to MAGNUM for sponsoring this post! I bought this shirt on sale and am so glad I did. Right now, it's on major sale. Use code SUMMER40 to get an extra 40% off of the $29 sale price.. making it... wait for it... less than $18. Winning. Not to mention, it comes in navy, white and red, too. It's casual, super soft and one of those things you can throw on in the mornings when you want to be comfortable but still look nice and put together. I bought this specifically for when I head down to the lake, because stripes + bodies of water go together like PB & J in my opinion. But who am I kidding, basically all I own is striped! These shorts are something I bought on a whim. I didn't have anything so casual, so I felt like I 'needed' them. I'm sure glad I have them now, because they go with everything and make for a really easy and comfortable weekend and post-work outfit. If you are looking into these, they are supposed to be 'boyfriend' style in that they are looser. I would suggest sizing down. I'm a 27 almost always but sized down to a 26 in these. Also, they are on sale with an extra 40% off the sale price using code SUMMER40. Which makes my outfit total under $50. 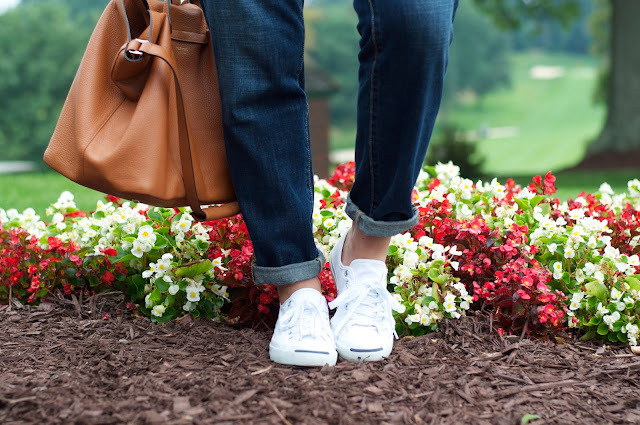 The sneakers are a basic in my wardrobe and they are a classic. They're great for both men and women, but I know that the Nordstrom Anniversary Sale has a pair specific to women (under $50), that you may want to check out! If you can't tell, 'Tis the season for major steals and deals. Have a fabulous day!